Home > Periodontal Disease > Wanna Know Causes Of Bad Breath? Wanna Know Causes Of Bad Breath? Bad breath also known as halitosis, can be caused by certain health problems, eating unhealthy foods, sedentary lifestyle, and poor oral hygiene. Bad breath can be temporary and persistent. On a temporary bad breath, you can easily get rid of bad breath by means of gargling, brushing and flossing. Basically, bad breath can be addressed while keeping the basic oral hygiene, dental health, and lifestyle changes. On the other hand, persistent bad breath is a relatively serious condition. Persistent bad breath can be known after diagnosis the cause. When you feel hungry or are fasting. Saliva appears when you're chewing food. But saliva is reduced when you do not chew for a long time. As a result, the bacteria grow and cause bad breath. In the morning. Saliva production stops while you sleep. Decreased saliva causes the growth of bacteria. When you're thirsty or not to drink, the body does not produce a lot of saliva so that the process of cleansing the bacteria will be reduced. Food: Consumption of foods such as garlic, onion, or a banana can cause bad breath. The content of these foods are absorbed into the bloodstream during digestion. In the lung, pungent smell and then transferred to the air which is then exhaled through the nose. Bad breath caused by food may last up to 72 hours. Oral hygiene: Poor oral hygiene, can lead to accumulation of food residue in the mouth. Various types of bacteria found in the mouth acting on particles of food, which releases hydrogen sulfide fumes, which cause bad breath. Oral hygiene is not maintained, such as not brushing and flossing, will make food particles stuck to the teeth. In the long term, the sticky food particles turn into a hard substance called plaque, which can ultimately lead to tooth decay and periodontal disease. Nose and throat problems: Causes of bad breath, can be attributed also with the nose. Every foreign substances trapped in the nose will be able to be the cause of bad breath. This condition can be caused by a sinus infection, which cause discharge from the sinuses to pass through the back of the throat, this eventually led to the stench. Moreover, throat infection also causes bad breath as well. Bacteria in the mouth tonsils can cause mild odor. The main cause for bad breath that arise in this area is calcification formed in the crevices of the tonsils. The white particles called tonsilloliths or tonsil stones. Tobacco and alcohol: Both alcohol and tobacco can cause mouth so dry, causing a foul odor in the mouth. In addition, cigarette smoke contains tar, nicotine, and other substances, which accumulate in the mouth, causing periodontal disease and bad breath. Alcohol consumption, can also lead to digestive problems, which can also be associated with bad breath. Dry mouth and fasting: It is common, have bad breath when you wake up in the morning. This condition is caused by a decrease in saliva production during sleep, because the mouth is kept closed for a long period. Therefore, saliva has a very important role in cleaning and moisten the mouth. This helps the fluid accumulation in the process of swallowing, which helps the mouth to get rid of the remnants of food, bacteria and dead cells. Saliva has the potential to kill bacteria in the mouth. With a decrease in saliva production, it can cause bad breath. In addition, fasting can also cause bad breath, because the breakdown of chemicals or ketoacidosis. 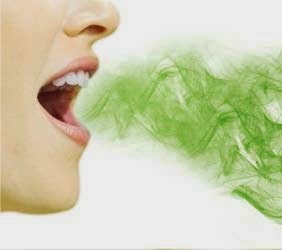 Other causes of bad breath: Some types of cancer can be the cause of bad breath. Lung infections and abscesses can produce bad breath. Even diabetes and chronic stomach acid disorders can cause bad breath. Some people with lactose intolerance can have bad breath, when they consume dairy products. Dentures can also cause bad breath problem, if not cleaned properly. Dehydration and constipation may also cause digestive problems that became one cause of bad breath.